The staff and volunteers of the Chicago Zoological Society welcome you to Brookfield Zoo and are happy to answer your questions. Brookfield Zoo makes a concerted effort to make its grounds, pathways, buildings, exhibits and programs accessible to all visitors. The information contained in Accessibility Guide will be helpful in answering your questions. For Wheelchair or Electronic Convenience Vehicle (“ECV”) rentals, please call (708) 688-8347 to reserve one in advance of your visit. If you call and leave a message prior to 5:00 p.m., someone will get back to you the same day. For a description of all the rentals available and associated costs, please click on “Rental (Alquiler)” below. An advance reservation for a stroller or wagon is not needed. Same day reservations for wheelchairs and ECVs are not accepted. 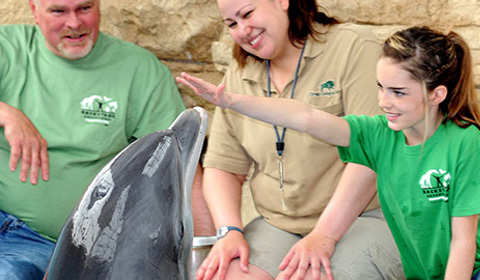 We strive to provide inclusive recreational programs to all of our Brookfield Zoo guests. To request an accessibile accommodation, ideally no less than 14 days in advance, please complete the ADA Accessibility Request Form or call the Society’s ADA Coordinator at (708) 688-8338. El personal y los voluntarios de Chicago Zoological Society te dan la bienvenida a Brookfield Zoo y están disponibles para cualquier pregunta. Brookfield Zoo trabaja en conjunto el equipo en el mantenimiento de las vías, los edificios, las exposiciones y los programas para que sean accesibles para todos nuestros visitantes. Encontraras información útil en Accessibility Guide. Nos esforzamos para proveer programas recreativos para todos los que visitan Brookfield Zoo. Para pedir acomodación, si es posible con más de 24 horas de aviso, por favor utiliza este formulario: ADA Accessibility Request Form o llama al coordinador de ADA en Chicago Zoological Society al (708) 688-8338. Electronic convenience vehicles (ECVs), wheelchairs, child strollers, and wagons are available for rent near the North and South Gates. Due to limited quantities of ECVs and wheelchairs, we recommend reserving one in advance by calling (708) 688-8347 to assure one is available for your visit. Same day reservations are not accepted. If a guest needs a wheelchair or ECV at the North entrance, a Crew Member can call North Buggies and someone will bring the wheelchair or ECV up to the North entrance. Some exhibits and buildings with narrow walkways may prohibit strollers from entering the building as they could pose a safety hazard in the event of an emergency evacuation. Guests with disabilities may use a personal mobility device in exhibits and buildings, such as a wheelchair or a stroller for a child with a disability or other type of personal mobility device (with the exception of gas-powered devices). BZ Care Kits are available at the North and South Guest Relations. These kits are designed for guests with sensory disabilities and include zoo visual schedule books, noise-deafening headphones, name tags, if lost ID bracelets and stickers. Large-print maps with access information are available at our North and Guest Relations to give you special instructions before entering the park. Service Animal Maps (with locations that are not ideal for service animals to go) will be provided to you upon your arrival or are available for download by clicking Service Animal Map. Motor Safari is wheelchair accessible.. There are accessible parking spaces available in both lots. (The South Gate is an easier entrance for people with disabilities). Brookfield Zoo has a teletype writer (TTY); the TTY number is (708) 688-8659 which is available for guest use at our Membership Office. Please see a Zoo staff person at South Gate Reception building for assistance. To speak to someone at the Zoo using the Illinois Relay service, please call 711 and then (708) 688-8000. Illinois Relay offers services for people who want to use their voice or hearing with their TTY, for Spanish speaking people who use a TTY, and for people who are deaf-blind and use a Telebraille device. Life-size statues and cutouts of animals are located throughout the zoo (gorilla, dolphin, tiger, etc.) Also, at Wolf Woods we have bronze plaques depicting social behaviors. Accessible picnic tables are located throughout the park. Assistive Listening Devices for presentations are available for loan in the South Guest Relations office near South Gate. The videos playing in The Living Coast and Seven Seas Dolphin Underwater Viewing are captioned. Educational programs are modified or developed to meet the needs of diverse audiences. 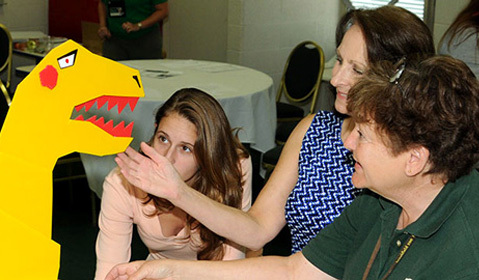 Sign Language interpreters are available for public programs and classes by advance request. Call the Society's ADA Coordinator at (708) 688-8338 or complete the ADA Acecssibility Request Form. Please allow a minimum of 14 days advanced notice. Good Works and Bridges Volunteer programs for teens and adults. Please call (708) 688-8304 for information.